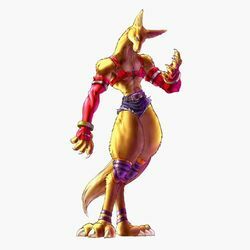 Fox, aka Hans Taubemann, is a playable character in the first Bloody Roar. In “Beast” mode, Fox can turn into a half-human, half-fox creature. At the end of the first game, Fox kills a person who turns out to be their own mother, and it is implied in later games that this leads to Fox’s suicide. Although Fox’s gender and sexuality are never directly discussed in the game, the character is represented as effeminate and vain, and hates all ugly things. Some reviews suggest Fox is either transgender or a crossdresser. The voice actor for Fox in the English release of the game is a woman (Samantha Vega). The original manual for the North American release indicates Fox is male, but in the European release Fox is listed as female. These combined factors suggest that Fox is meant to be read as a transgender character, but this is only implicitly so. You can see Fox in action in the video here. 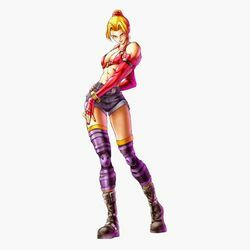 This entry was posted in 1990s, Playable Character, Transgender, Transgender (implicit) on September 1, 2015 by Adrienne Shaw.